Look good and feel great when you head out on the boat this summer! The weather will be a much less significant factor in your enjoyment if everybody is dressed in the latest high-tech materials and light-weight layered fashions. Read all about how to stay warm and dry (or cool and dry) this summer. Kris Hughes tells us what the top companies are offering in their nautical fashion lines for 2018. The Canadian Yachting April 2018 issue also features a detailed Power Review on Cruisers Yachts glamorous new Cantius 42 and a Sail Review on the exciting new Dufour 412. Our destination stories will take you to British Columbia where Catherine Dook tells us how to be a Polite Canadian and Sheryl and Paul Shard, award-winning travel writers and stars of the Distant Shores TV show take us on an in-depth tour of the Canary Islands and Capo Verde. The Galley Guys go from Hogtown to Hogfish in Key West. 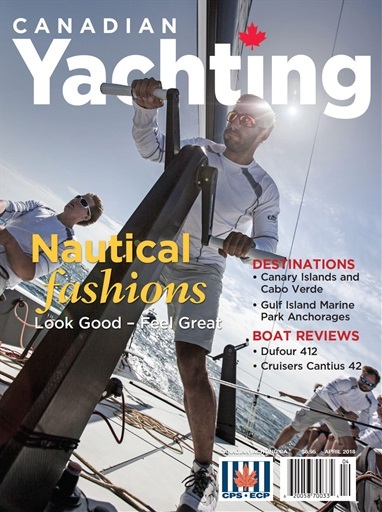 Enjoy the latest CPS-ECP Port Hole and much more in our 2018 Nautical Fashion edition.